Summary (Goodreads): Simon Lewis has been a human and a vampire, and now he is becoming a Shadowhunter. But the events of City of Heavenly Fire left him stripped of his memories, and Simon isn’t sure who he is anymore. He knows he was friends with Clary, and that he convinced the total goddess Isabelle Lightwood to go out with him…but he doesn’t know how. And when Clary and Isabelle look at him, expecting him to be a man he doesn’t remember…Simon can’t take it. Just when I thought I couldn’t love Simon Lewis more, I read TFTSA and I realize I’ve never been more wrong. Some background on our hero: Simon starts out in The Mortal Instruments series as a huge nerd with a huge crush on his best friend, Clary (the protagonist of the series). He gets turned into a rat (for a short period of time), and then becomes a vampire. However, he drinks some of Jace’s blood (which has more angel blood than most Shadowhunters) and is able to go out in the sunlight, unlike all other vampires. At the end of the series, he sacrifices himself to save his friends (and new-ish love interest, Isabelle) and becomes human again, but his memories of everything to do with the Shadow world are erased. Clary (along with the warlock Magnus, Isabelle and their other friends) bring him back into their world, but they remember everything about him, and he knows nothing, which is why he decides to enroll in the Academy. I love Simon’s narration. He’s funny, he’s smart, he wears nerdy t-shirts, it’s the whole package. At the Academy, he’s known for the hero he was, but since he doesn’t think he’s that same person, he decides to start over. So he moves from the elites, the Shadowhunters, to the dregs, or humans. That is one of the biggest things that I liked about this book. Simon is so aware of the prejudice and discrimination in the Shadow World, and he is not afraid to say something about how mundanes/Downworlders/Faeries are treated, since there was a time when he was a mundane and a vampire. Along with this (sort-of) exposure of the unfair treatment in the Shadow World, this book contained a lot of Shadowhunter backstory, from Jack the Ripper’s defeat (it was Will and Tessa) to James Herondale’s treatment at the Academy to the story of Valentine and the Circle. With these short stories, Cassandra Clare has a lot more freedom to explore this extensive world she’s created and do deeper into smaller character’s backstories. “You know, this porridge isn’t at all bad,” Simon said, digging in. George nodded enthusiastically, his mouth full. Simon meets a lot of new people at the Academy, but I’m assuming that everyone’s favorite is George Lovelace. George is Simon’s best friend, he loves One Direction and he has a Scottish accent, and I adore him. He’s very loyal to Simon and sticks with him even when some of the other students are awful (which they are). However, the new characters are not as important as the old ones, like Clary, Jace, Alec, Magnus, and Isabelle, who is the most prominent in TFTSA. Simon’s relationship with Isabelle goes through a lot of changes in the book, but as always, it’s funny and heartwarming and super awkward. I was extremely happy with the ending of the story, and I have more information to combine with the short story at the end of Lady Midnight now! 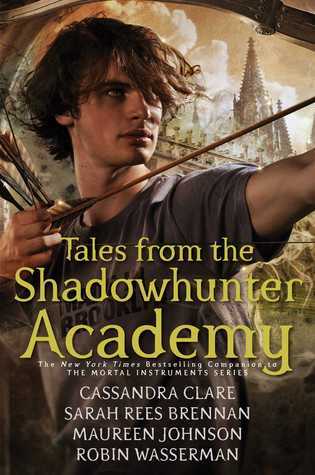 Although there were some slow flashback moments throughout, Tales from the Shadowhunter Academy is definitely worth it if you want more information about any of Cassandra Clare’s characters.